The Plantronics DA70 is used in customer service centers that use PC-based softphones. The DA series of audio processors offer exceptional quality and control, and they help you meet OSHA and Noise at Work specifications. With Plantronics and third-party software applications you will be able to communicate with intelligence and activate new experiences for your team and customers. Lightweight and simple to use, with USB easy-to-operate connections and Quick Disconnect features so your team can easily switch between workstations. With built-in Digital Signal Processing for leading audio clarity, Noise at Work protection for associates and enhanced controls to improve customer conversations. The full CI functionality goes one step further - providing operational insights to improve personnel performance, processes and inventory management. 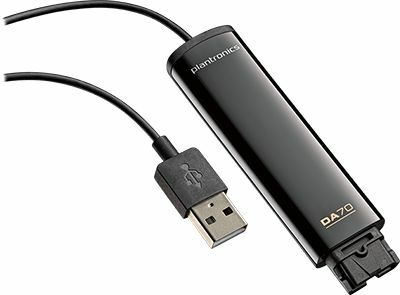 The DA70 connects your Plantronics Quick-Disconnect analog headsets to PC via USB.